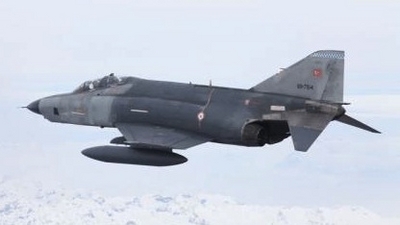 There appears to be agreement on the basic facts: a Turkish F-4 violated Syrian airspace and the Syrian military shot it down over its territorial waters. Further, there is no dispute that the AKP-led Turkish government has for months offered sanctuary and armed the Syrian opposition forces in what amounts to a civil war in Syria between a hideous, brutal tyranny and an increasingly Islamist opposition. The Turkish leadership, even while accepting that its plane violated Syrian airspace, is growling about retaliation. The Syrian government has done its best to tamp down Turkish anger. How should Western states respond to this crisis between Ankara and Damascus, one which has the potential to grow into a war between two states? More specifically, what if the Republic of Turkey invokes Article 5 of the NATO treaty, which in the case of "an armed attack against one or more of them ... shall be considered an attack against them all and consequently they agree that, if such an armed attack occurs, each of them ... will assist the Party or Parties so attacked by taking ... such action as it deems necessary, including the use of armed force"? "If Turkey loses, Syria and its proxy Iran become the dominant power in the Middle East. It will enhance their reputation enormously and this would be awful for Israel as well as Turkey." First, it's not quite clear what constitutes a win, as we don't know what the objectives in such a war would be. If Ankara fails to impose its will on Syria, that's a positive outcome. If the AKP leadership gets a bloody nose for having been too bellicose, that's fine too. I fail to see how a Turkish victory over Syria is good for Israel, given my prediction that Turkey (nor Iran) is long term the most dangerous country in the Middle East. "And if Turkey wins, without Western aid, it would clearly demonstrate that Turkey no longer needs Western support and can go it alone. This would not only free Turkey's options in the region but it would diminish US interests further and isolate Israel even more, because Turkey free from Western pressure and aid can act much more freely and aggressively towards Israel." I agree that a Turkish victory would be bad for the West and for Israel. "The best outcome for Israel would be a Turkish intervention with the aid of NATO. This would get rid of the brutal Syrian regime and thus free an agent of Iran who has been a Thorn for Israel since god knows when and would leave Turkey grateful for the US in particular and leave Turkey more open to US pressure to normalize and increase its relations with Israel." That NATO should be party to Turkish aggression is anathema to me. Nor do I see how NATO would gain more influence over a militarily triumphant Erdoğan. "As long as states like Syria and Iran remain, Turkey and Israel need each other and both of the aforementioned countries having bad diplomatic relations is only good for states like Iran." I see this assessment as out of date. The Republic of Turkey no longer seeks good relations with Israel or the West and it is unhealthily nostalgic to try to turn the clock back. June 25, 2012 update: For context, note that, apparently, Turkish F-4s routinely penetrate Greek airspace. The website OnAlert.gr has several videos of what it says are examples of this. June 26, 2012 update: Murat Yetkin published this map of the downed F'4's movements in today's Hürriyet. 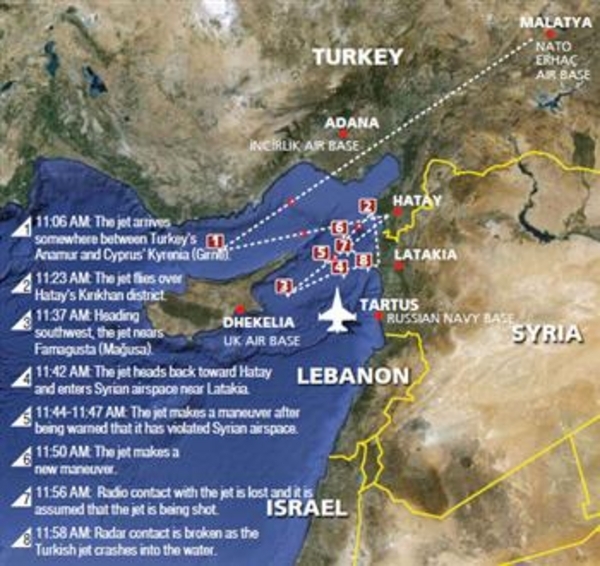 June 27, 2012 update: My blog, "Mavi Marmara 2010 = Syrian Anti-Aircraft Fire 2012," continues this analysis. June 29, 2012 update: According to the Wall Street Journal, American intelligence services are confirming the Syrian account of the incident, which is that a Turkish warplane was within Syrian airspace when shot down. July 1, 2012 update: In his trademark blustery style, Turkey's Prime Minister Erdoğan has accused the Wall Street Journal of cowardice, declared it has a history of publishing lies, and said that it has an anti-Obama agenda. Comment: Good thing that the prime minister who has jailed more journalists than any other leader in the world cannot bring American media under his control. Sep. 29, 2012 update: Startling news from Al-Jazeera: It claims to have papers indicating that the Syrian government debriefed and then executed the two Turkish pilots. We shall see. Jan. 18, 2017 update: According to Greek sources, the Turkish Air Force carried out 57 overflights over Greek territory in 2016, the most ever since 2009, when records were first published. The period 2011-15 saw 4, 3, 11, 14 and 36 overflights respectively.